Why Use Project Management Simulations? The Warehouse Construction simulation is an online Project Management simulation that can take around 40 minutes to complete. Project Management is a complex and dynamic subject. It cannot be taught solely by classroom lectures, books, or case studies. Teaching Project Management theory is easy, but no two projects are the same. Project Management Simulations are required for students to learn through experience, and online simulations can help a class of several hundred students experience project management. The Warehouse Construction Project Simulation has been developed as an online simulation designed to encourage a cohort of hundreds of students to experience project management rather than sit in lectures, or examine static case studies. Download a marketing Warehouse Construction Project Simulation Flier here. What is it? Who is it for? How Long Does it Take? The Warehouse Construction Project Simulation is a test of assigning resources to a schedule in order to complete the project on time. 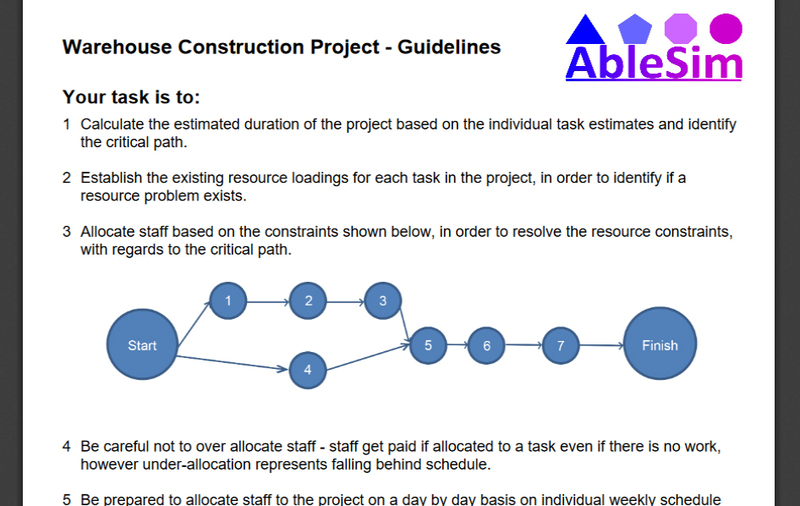 The Warehouse Construction Project has seven tasks, and the use of up to 14 resources. Can you complete it as fast as possible? The simulation is designed for Project Management students, or Project Team members who may be learning about project management, or on a team-building course. The simulation takes around 40 minutes to complete, and can be repeated many times with differing results. There are even one or two surprises along the way! The following gallery shows the product in full detail. The simulation is available on-line here. Experiential Learning is Learning by Doing. The Free Trial Simulation tests the ability of people to apply what they have learnt concerning resource allocation.